Thanks to Daniel, we have images of TE01 and TE11 modes using CST, check it out! The schematic symbol image for coax shown here is provided in our free schematic symbols download which you can find here. Go to our download area and get the new Coax.xls spreadsheet. It calculates and plots (over frequency) three types of loss (metal, loss tangent, and dielectric conductivity), and uses a "more exact" metal loss calculation, so it is more accurate (and way more convenient and infinitely cheaper) than EDA software such as Agilent ADS. It just might be our coolest spreadsheet yet! There is also a new multi-dielectric coax spreadsheet in the download area for your enjoyment, thanks to Alex!! Coax provides the very desirable transverse-electromagnetic (TEM) mode of transmission. The filling factor for coax is unity, and "Keff" is equal to ER. Coax has no lower cutoff frequency (like waveguide does). These formulas are the exact calculations for capacitance and inductance per length for coax cable. We'll try to stick with the "prime" nomenclature whenever we are talking about quantities that are normalized per unit length. Where b and a and the radii of the conductors. Feel free to replace them with D and d! What is meant by the cutoff frequency fc? The desirable TEM mode is allowed to propagate at all frequencies, but at frequencies above fc the first higher-order mode called TE11 is also allowed to propagate. Higher-order mode that will screw up your loss and VSWR and as they have different propagation velocity than the TEM mode and will interfere with it. Higher modes will be excited at small imperfections, bends, etc., but below cutoff they rapidly disappear along straight sections of coax. To be sure that only one mode propagates, thus keeping the signal clean, you will need to stay below fc. To obtain good performance at higher frequencies, smaller diameter cables are required to stay below the cutoff frequency (thanks for the correction, Gary!) This is the reason that precision air-dielectric connector families have progressed from 3.5mm, to 2.9mm, to 2.4mm, to 1.85mm and now to 1mm as microwave applications have moved from X-band to W-band frequencies. For more info on connector species, check out our section on microwave connectors! In order to minimize losses due to skin depth, you want to use the BIGGEST coax cable you can that won't support TE11 mode . 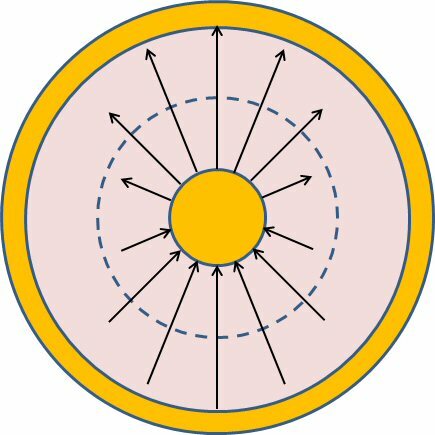 The criteria for cutoff is that the circumference at the midpoint inside the dielectric must be less than a wavelength. Note: this is an APPROXIMATION of a transcendental equation which must be solved numerically. If you are interested in reading about the true solution, we suggest you pick up a copy of Pozar's book. Last, we offer simplifications for cutoff frequency in both SI and English units, with the assumption that μR is usually =1 for any dielectric we might be interested in. We've also tweaked the equations so units for frequency are GHz (instead of Hertz). For November 2015 we have a frequency plot illustrating cut-off frequency, thanks to Purushothaman. What does the frequency response look like for the first two modes? For a coaxial line with D = 5 mm and d = 1mm and air as dielectric (ER=1), the cut-off frequency equation solves to 31.81 GHz. In the plot below, ‘1’ in parenthesis represents the first mode (i.e., TEM mode) and ‘2’ represents the second mode or the first non-TEM mode (i.e., TE11 mode). Just as predicted, TE11 starts propagating at 32 GHz; it is highly attenuated depending on how far below cutoff you operate. This plot was produced using CST's electro-magnetic solver. Note that TEM continues to propagate in the region above 32 GHz, but the two modes will interfere with each other and you may get unexpected results. Thus, it is a good idea to stay below the TE11 cutoff, unless you have a good reason and know what you are doing. Why would you risk operation anywhere near TE11 cutoff? 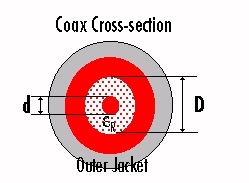 Attenuation due to metal is reduced by making coax larger and larger. A 7mm air-line will have 1/2 the loss of a 3.5mm air-line, but above 19 GHz, 7mm coax propagates two modes and should not be used. You can evaluate cut-off frequency using our coax calculator. Microwaves101 Rule of thumb #117. The 90% rule: coax is never specified to operate beyond 90% of its TE11 cutoff frequency. Below is a list of commercial connector species' cutoff frequencies we calculated using our downloadable coax spreadsheet, and the ratio of recommended to actual cutoff frequencies. TE11 mode, cable also sliced at maximum E-field strength. What we failed to capture is that there are field lines on the east and west side that start and stop on the outer jacket and by looping out and back. 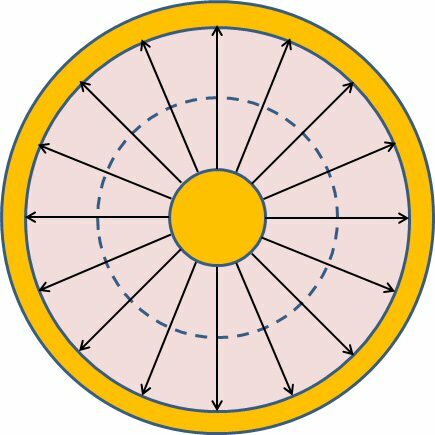 Note that in TE11 mode, the magnetic fields are no longer purely transverse, they point in radial and longitudinal directions, and as always, forming closed loops. This material was moved here.